Are your smocking stitches getting tense? Does your bishop or collar have that "turtleneck" look rather than lying smooth and flat? These problems will disappear when you use a Smocking Board. This outstanding invention will ease your smocking woes and allow you to produce a perfectly sized project with even tension throughout every time. The board itself is made from a specific density cork that has both vertical lines (in one-inch increments) and concentric circles (representing neck dimensions - infant through adult). This provides a stable surface on which you can accurately control the movement of the smocked piece while allowing you to form uniform tension of the smocking stitches. Small head, short , narrow shaft pins are provided. The Smocking Board is a "must have" for both beginners and experienced smockers. 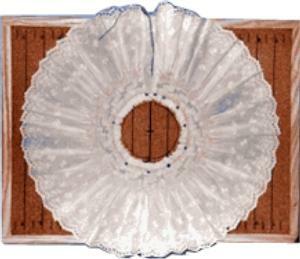 The Smocking Board provides an accurate, symmetrical medium on which to size inserts and yoked garments. Simply pin the center of the piece to the center line of the board, then pull out the piece to match the size of your yoke pattern piece and secure with pins. You are ready to start smocking! 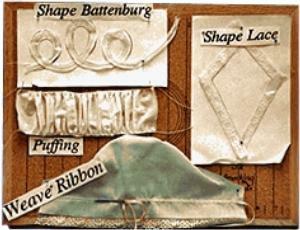 The Smocking Board handles the challenge of a bishop effectively by allowing you to "size" the piece in a complete circle with the exact neck size. The pleats of the smocked piece radiate out evenly making your stitch tension easy to keep even. Puffing: pinning end of piece to be puffed to board makes it easy to gather both sides evenly using shirring threads. Lace Shaping: the board provides a smooth, flat surface to pin patterns on and then shape lace. Battenburg: pin pattern to board, shape and pin battenburg tape to pattern, work battenburg stitches between pinned tape. Weaving Ribbon: pin smocked area to board and weave ribbon through stitches. Tracing: lay pattern piece on board, pin fabric on top, trace with pencil or water-soluble pen. Faggoting: pin strips of fabric to board, work faggoting stitches between fabric strips. These are the most difficult to size evenly and to produce accurate tension of the stitches. The Smocking Board handles this challenge effectively by allowing you to "size" the piece in a complete circle with the exact neck size. The pleats of the smocked piece radiate out evenly making your stitch tension easy to keep even. Battenburg: pin pattern to board, shape and pin battenburg tape to pattern, work batternburg stitches between pinned tape. The entire process was easy, fast and I am completely satisfied.